Rocky, a sweet young cat. Lil' Rocky is a fighter. Can you help her go the distance--or further--and give her a loving home? This sweet girl, weighed just 6oz. when she found her foster mom. She was nursed back to health, but one of her eyes was injured beyond repair. Yet after all she's been through, she is a total love bug. Rocky is presently living in a foster home, but she is available for adoption through the Companion Animal Alliance, Baton Rouge, LA. Please email Maria at caamariae (at) gmail (dot) com if you are interested. You can see more pictures of Rocky here. Oh Rocky! You are a very brave girl and I am so happy you are with good foster mom. I hope you will find your forever home very soon!! 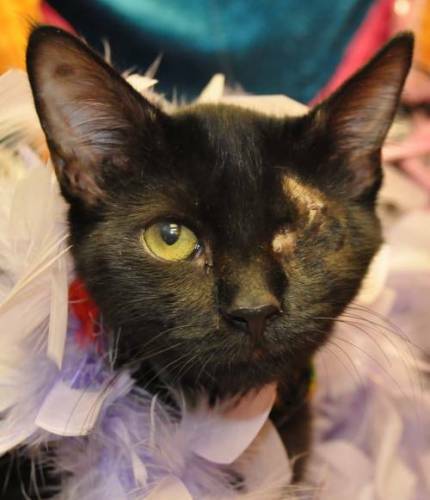 We'd like to say how wonderful one-eyed cats are and they are NOT handicapped in any way. Rocky is a special girl and will find her 4-ever home. We fostered a one-eyed kitten last year and a year later, he's the famous Odin. Rocky - you are and will be in my prayers! You are a beautiful little girl! Purrs to Rocky the little sweetheart for finding a loving forever home very soon. We are purring and praying for Rocky! We just know there is a loving forever home out there for a beautiful girl like her. did Rocky find a forever home yet?